If you’ve landed on this page, you’ve probably heard the term siphon coffee before. 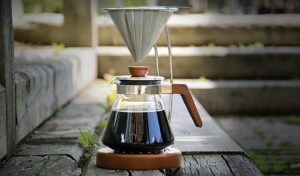 And if not, we’re psyched to be the ones to introduce you to the coolest way of brewing a cup of joe. 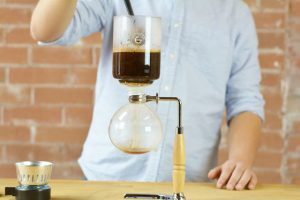 In this post, we’ll explain what siphon coffee is, how it works, along with a step by step guide on how to make it. Let’s begin! Siphon coffee, also known as vacuum coffee, vac pots, syphon brewed coffee, etc., has been around for years. A French housewife and German engineer invented this in the 1930’s. They first discovered coffee tasted best when it wasn’t’ boiled and pulled under a vacuum. Through a series of trial and error experiments, they came together with something that progressed into quite the theatrical brewing process. The excitement of this coffee maker has even sparked intense siphon competitions is Japan- Google it. You won’t be disappointed. How does a siphon coffee maker work? A Siphon coffee maker works with a little help from our friend; science. It consists of five basic parts; the globe pressure pot on the bottom, the funnel or brew chamber in the top, burner, lid, and a filter. The process looks complicated but once you get a hang of it, it’s simple. How it works is you heat water in the bottom globe with the burner then secure the top funnel in place. When the water is hot enough (typically just below boiling point), the vapor pressure forces the water to rise up into the top funnel where it brews. Once the water has made its way into the top funnel and the coffee grinds have been added, it’s time to remove the heat source. The vapor pressure will then release and gravity will draw back the coffee through the filter into the globe. Although this brewing method can be time-consuming, it is actually quite a thrill. The end result? The finest cup of coffee you’ll ever drink. Science rules! There are various kinds of filters that can be used to make siphon coffee. Some of the more common ones include; cloth, nylon mesh, and paper. For many people, cloth filters are typically the filter of choice for siphon coffee lovers and baristas alike. Because paper filters being too fine to absorb and trap the natural oils of coffee, whereas, cloth filters allow these oils to pass through into the vac pot. So extracting these oils are essential for a full flavored cup. How often do you need to replace the filter? If you’re using a cloth filter, we suggest switching out after 2-3 months of consistent use. Also use a mild detergent, hot water, and a scrubbing brush to clean the filter. Make sure to give it a thorough rinse after each wash so no detergent gets left behind. The filter will get stained from the coffee the first time you use it so don’t fret if it doesn’t look like it did when you bought it. If you have OCD tendencies and wish to take it one step further, however, you can soak it in Oxyclean and hot water. Ensuring all your coffee gear is properly cleaned is essential for great tasting coffee. 1) Start by attaching the filter’s spring clip to the bottom tube of the funnel. This keeps the filter secure and prevents any grinds from passing through. 2) Next add 400 g of pre-heated filtered water to the bottom bulb.You can fill it to the 400 ml marker or use a weigh scale to get to 400 grams. 3) Then fill the alcohol burner with fondue oil, making sure the wick sticks out from the top when you put the lid back on. Then you’ll see the wick start to change color as it absorbs the colored fuel/oil. Honestly, it looks really cool when it does that. 4) After that carefully light the wick and apply heat by placing the burner under the globe. 5) Next, place the top funnel on an angle into the globe while the water starts to heat. 6) After that, measure and grind 30 g of coffee medium-coarse (the size of table salt). For best results, grind coffee right before each brew. You can adjust coffee amounts up or down depending on your flavor preference up to 40 grams for super strong coffee. 7) Then secure the top funnel into the bottom when you see the water in the bottom globe start to bubble. The water will slowly make its way into the funnel. When most of the water has made its way up to the top filter (a little should remain at the bottom), add the grinds and stir. 8) Stir the coffee well, ensuring all the grinds become saturated. Let the coffee sit, untouched for one minute. Remove the heat source and stir the coffee grinds approximately 10 times for complete saturated immersion brewing. 9) The coffee will begin to filter into the globe. This process is called the “draw-down” and typically takes about a minute to finish. Remove the funnel and place it in the lid which has a holder built in. 10) Finally you’re ready to serve and enjoy! Thanks for reading! Let us know what you think in the comments below. Im happy to see that you sell the spare filters for the coffee syphons too.Do you carry the spring part as well or the glass parts? Im in vancouver and glad i found your site as here a quality syphon coffee maker if far to expensive to afford! Glad to see you guys sell the filters for the syphon , but Id suggest you come out with a stovetop version, or carry the butane burners for better control and speed over the process. The fuel oil burners work ok, but are slower than the butane ones . 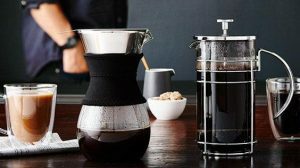 How does your syphon coffee makers differ from others made by Hario or Bodum? From what I can see they all work on the same principles of pressure and vacuum. Is it just quality and shape ? Once I tried this, I was surprised how easy it was to make. It looked hard. Now its my weekend pleasure to make coffee in a Syphon! I do need a butane burner, though. It makes it faster. Since I dont have one I pre-heat my water and it only takes about 5 minute with the included fuel burner. Thank you ! Good explanation, it took me a longer time the first time to make it and now its much easier and quicker as I know how. Even my first cup of siphon coffee was delicious, and they keep getting better overall as I master the techniques. Nice easy explanation of Syphon coffee. Looks easy now. you should make a video of it.